Little tasks keep getting done. Bit by bit they come together one day to the next. A part picked up here, a another purchased there and things start to function. 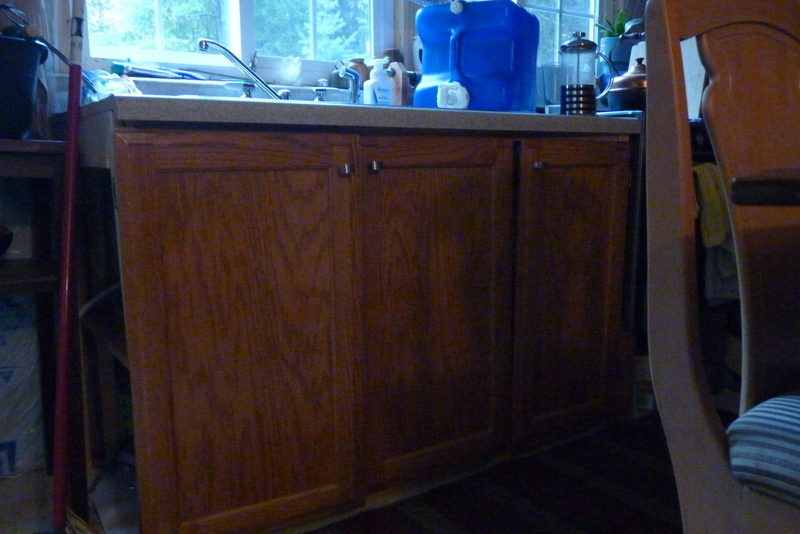 The biggest improvement in the last month has been the advancement of the wiring and the kitchen cabinets going in. The wiring is all 12 volt. It comes off the battery bank into the house with no need for conversion, thus saving a lot of the energy that is lost as people convert from 110 to 12 volt. I have been limited to one old camper style light but have recently made huge steps forward. new wall sconce, switch for that one and the ceiling light, (switch not wired in yet but the wires are in place behind) and 12 volt outlet. With the help of the ‘snoring bear’ the has been run up to the vaulted ceiling. I am now in the hunt to find 12 volt ceiling fan. Two wall sconces I picked up at the Restore. 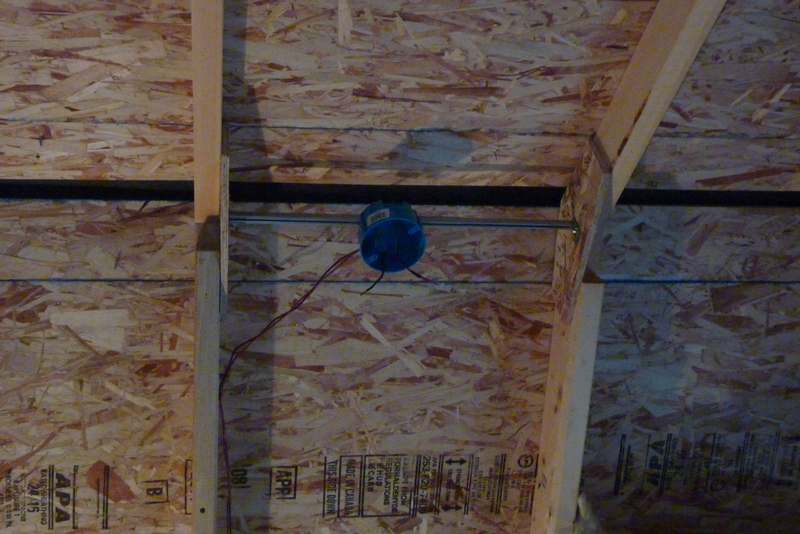 You can use any light fixture if you get a special bulb made for 12 volts. These two I couldn’t pass up. My 12 volt outlet is also hot now. That means the lap top wont go dead every hour and a half, needing recharging elsewhere. I can also now charge my cell phone and other such devices. Soon the last of the insulation will go in and the sheet rock will go up. The east end wall will be done in a rocket stove and cob next year but there just was not time this year to get it done. A couple windows are still planned on but with the way the weather and winters can be in Montana it is a better idea to insulate and sheet rock now with plans to take down next summer for more work. Being cold is a way to really ruin the joy of living in the mountains in winter. Today is the first day snow flakes have come down here this year, quite late, but we have had cold rain for days. The fire has been going and while I am a long way from having all I need for the course of the winter I have been warm and cozy this far. 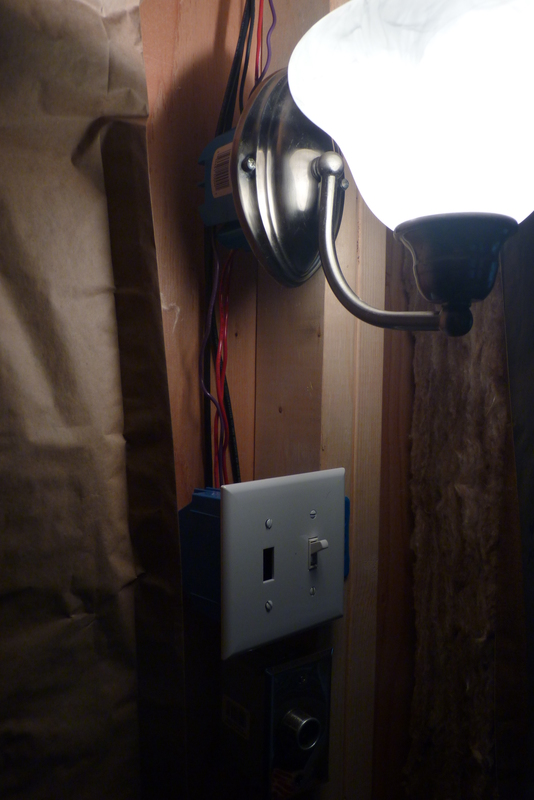 This entry was posted in 12volt, kitchen, offgrid, wiring and tagged 12 volt sysstem, 12 volt system, 12volt, bon fire, cold weather, DIY, little cabin DIY, off grid on November 2, 2014 by Anjmacz.